One Source Equipment Rentals has Miller Spectrum plasma cutters for rent or sale. These units will cut any metal that is electrically conductive including: steel, stainless steel, aluminum, and copper. Softer metals like aluminum, copper, and stainless will derate the cutting depth. So a plasma cutter rated at 7/8" for mild steel might only rate 3/4" for aluminum. The process of plasma arc gouging produces less dust, smoke and other harmful environmental hazard as compared to carbon arc gouging. Applications include construction, maintenance/repair, fabrication, and manufacturing. 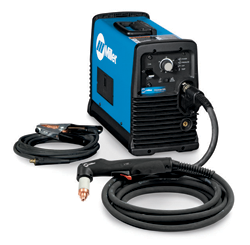 This plasma cutter offers big cutting power in a small package. The 875 Auto-line™ unit automatically connects to any primary input voltage from 208-575 volts in either single of three phase. Cutting Capability: Rated 7/8", Sever 1-1/4"
KVA: 9.7 400 VDC Air or Nitrogen only H: 13.5"
* Welding leads, are available for rent or sale. Auto-line™ automatically connects the Spectrum® 2050 to any primary input voltage from 208-575 volts in either single of three phase. Cutting Capability: Rated 7/8", Sever 1-1/8"
KW: 7.4 280 VDC Air or Nitrogen only H: 17"
Cutting Capability: Rated 1", Sever 1-1/2"
Starts without high-frequency, so it will not interfere with or damage computers. KW: 13.7 - Air or Nitrogen only H: 17"